It isn’t all the time that you can see a bright comet in the night sky. Most comets are rather dim and you’ll need at least a binoculars or a small telescope to see. However, from time to time, you may get lucky. You may be able to see a comet which is bright enough to be seen with your naked eye. Currently, you can consider yourself very lucky. There are two bright comets in the night sky, not one. The first comet I will introduce to you caught everyone off guard. Comet 17P/Holmes supposed to be rather uninteresting comet. It was predicted to be very faint, in fact, a few times fainter than the elusive dwarf planet, Pluto. However, last week, 24th October 2007 to be precise, it suddenly “exploded” and brighten by a few thousand times. Now, at Mag 2, it is even brighter than planet Mars. 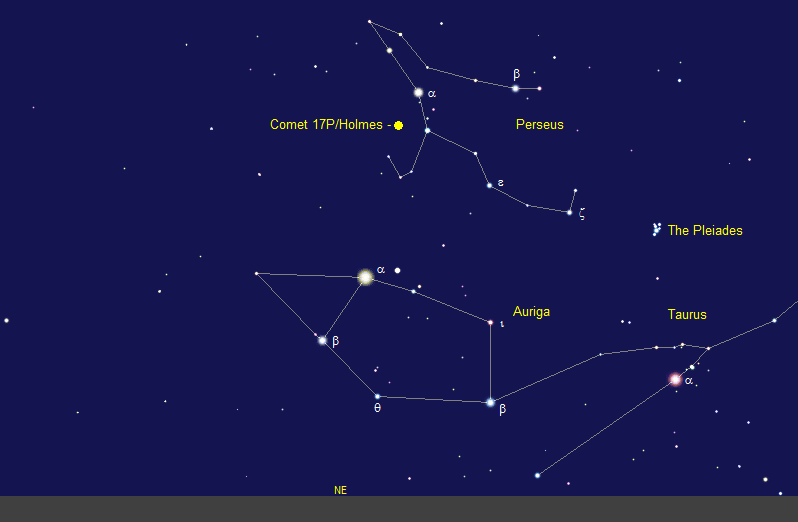 You can start to look for the comet after 9pm in the constellation of Perseus. The second comet is barely visible to the naked eye. However, Comet C/2007 F1 LONEOS, is still an easy target if you know where to look. In fact, it may even be more beautiful than the Comet 17P/Holmes, as the tail can be seen. Currently, the comet is low in the western sky and can only be seen before 8.30pm. Therefore, to see the comet, you’ll need to find a good spot where the western horizon is unobstructed. The comet is roughly halfway between Jupiter and the Sun. More information on this comet can be found here.